European Face Centre, Universitair Ziekenhuis Brussel, Laarbeeklaan 101, 1090 Brussels, Belgium. Hemifacial microsomia is the second most common facial birth disorder, with a prevalence of one in 3,500-6,000 live births. In 70% of individuals, the condition is unilateral [Figure 1]. The “O.M.E.N.S.” acronym is the most commonly used way to categorize hemifacial microsomia. This acronym stands for orbital, mandibular, ear, facial nerve, and soft tissue deficiencies, which are rated on a scale of 0-3, according to their severity. Most striking upon clinical examination are the external ear deformities [Figure 2] and the facial asymmetry. The latter is related to deficiencies in the vertical ramus compartment, originating from both skeletal tissues (mandible and skull base) and soft tissues (muscles of mastication and subcutaneous fat) [Figure 3]. The mandibular deformity, considered separately from the skull base (temporal bone and orbit) deformities, has been classified by Pruzansky and Kabanas Type I to III[3,4] [Figures 4-7]. 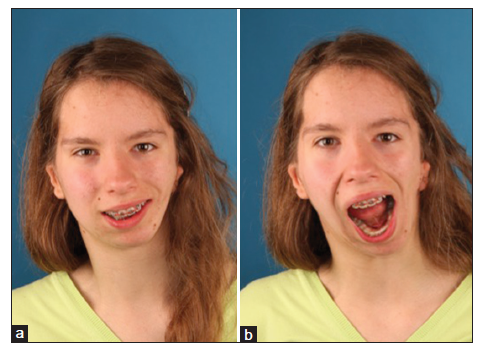 From the mid-1970s to the mid-1990s, treatment modalities for Type I and Iia Pruzansky-Kaban mandibular deformities included orthognathic treatment during adolescence or “functional” orthodontic appliances and early mandibular osteotomies to keep pace with the rate of vertical midfacial growth. For Type IIb and III deformities in growing children, joint reconstruction with costochondral grafting was indicated. In the mid-1990s, early distraction osteogenesis, before skeletal maturation and/or permanent dentition, was believed to induce the formation of not only bone, but also of soft tissue. However, a study published in 2002 and a systematic review published in 2009 concluded that there are no long-term benefits to early osteodistraction in the vertical ramus. The aim of this article was to explain the author’s protocol for the reconstruction of the vertical ramus compartment in hemifacial microsomia, highlighting the key issues of the technique. All patients involved in this article agreed to publish their facial pictures and signed the consent form. To illustrate the author’s treatment strategy for a deficiency of the vertical ramus compartment, 10 salient points are presented with illustrative photographs from a series of patients. The general approach for the different Pruzansky-Kaban types is presented in Table 1. Orbito-zygomatic and jaw angle reconstructions are performed in all types of hemifacial microsomia following the facial rotation procedure. Hard and soft tissue volume deficiencies can be addressed by free gluteal fat transplantation, three-dimensional (3D) printed patient-specific titanium implants or a combination of both. 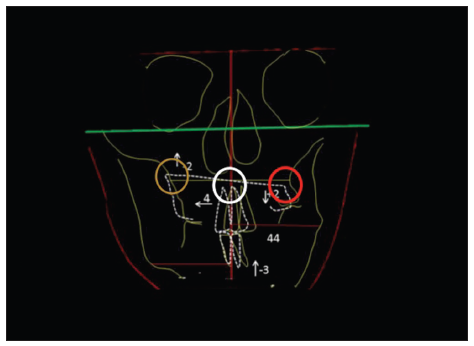 The facial rotation procedure, consisting of rotation of the maxillary, mandibular, and chin segments around a sagittal axis, while translating the midlines of all segments to the predetermined facial midline and advancing the lower face to the ideal facial profile in a sagittal plane, results in displacement of hard and soft tissues to the normal side [Figures 8-10]. This results in additional asymmetry when the left and right sides are mirrored, necessitating the next procedure: compensating for the volume deficit. 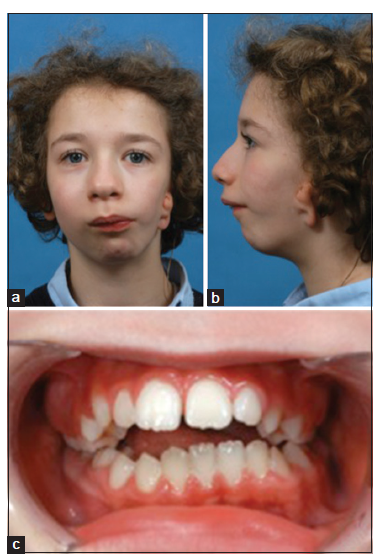 Prior to orthodontic decompensation, at the age of 11-12, it is necessary to judge the retromolar bone stock. 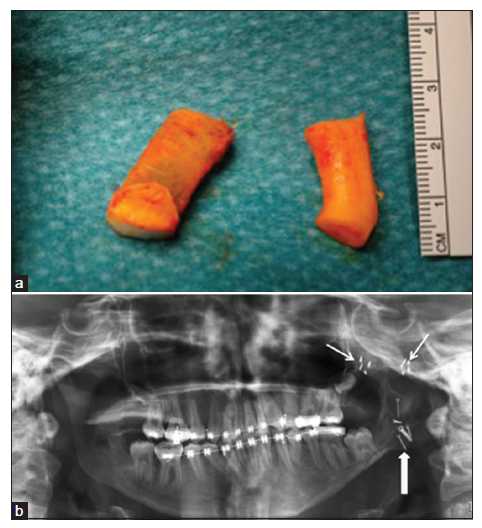 In view of the upcoming sagittal split osteotomy with the substantial advancement of the affected side, a decision must be made between removal of impacted second and/or third molars or osteodistraction of the horizontal ramus. Osteodistraction not only creates more bone to work with, but it can also partially correct the horizontal deficiency [Figure 11]. The fibrous tissues of the vertical ramus compartment can be stretched more easily when the process occurs gradually. After the latter procedure, vertical ramus lengthening is easier to perform, as more bony overlap allows for more stable osteosynthesis and improved healing. Rotation of the maxilla around a sagittal axis determines the correction of the occlusal plane cant and helps to swing the mandible to the midline [Figure 12]. The dental midlines are translated toward the healthy side for alignment with the predetermined facial midline. Finally, the chin point is adjusted in a translational way to correct the skeletal mandibular midline. The chin point is often also rotated along a sagittal axis to deal with the symphyseal height difference. Disimpacting the affected side necessitates a bone graft, obtained from the calvarium or iliac crest. Impacting the healthy side does not stretch the fibrous remains of the masticatory muscles on the other side and is possible only when a gummy smile exists on that side [Figure 13]. The decision for the pivot relates to aesthetic desiderata (normal tooth-to-incisor distance and limited gummy smile) and functional desiderata (anti-relapse biomechanics). Hence, the pivot can be located at one of three positions: at the zygomatic buttress of the healthy side, at the zygomatic buttress of the affected side, or at the nasal spine. Pivoting at the affected side (and hence impacting at the healthy side) provides the least risk of relapse. Skeletal suspension is mandatory to control the correction of the occlusal plane cant and the dental midline during healing [Figure 14]. As most cases of hemifacial microsomia are unilateral, the rotational movement leads to different relapse vectors at both sides. Interarch elastics will safeguard the occlusal relationships, but not the skeletal relationships. The focus of interest is the occlusal plane and the lower dental midline. An orthodontic bone anchor or piriform aperture suspension wire(s) provide a means to suspend the rotated mandible with postoperative elastics to a stable osseous midface structure. Suspending the mandible to the repositioned maxilla is not sufficient, as it may give way and derotate. 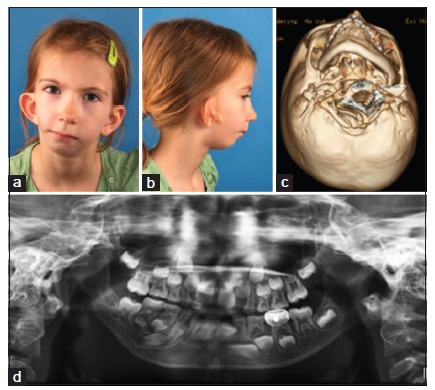 The oculo-auriculo-vertebral spectrum encompasses both hemifacial microsomia and Goldenhar syndrome. In addition to the aforementioned features of hemifacial microsomia, individuals with Goldenhar syndrome may exhibit ocular dermoid cysts, coloboma in the upper eyelids, delayed tooth eruption, speech and hearing disorders, and a cleft lip, alveolus, and palate. They may also have extracranial anomalies, including heart and kidney defects and fused or missing vertebrae (which occur in 30% of cases). The resulting scoliosis causes the cranium to be obliquely positioned on the thoracic spine [Figure 15]. In hemifacial microsomia, a missing, deformed, or dystopic orbit may already cause the normal reference frames (bipupillary plane, infraorbital plane, and brow plane) to be unreliable. 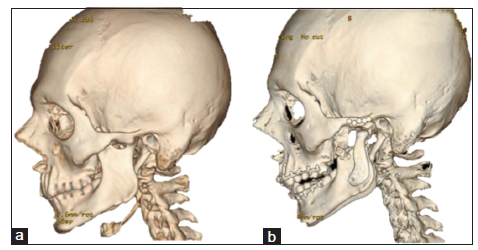 When the patient is also scoliotic, the surgeon is challenged to find the best compromise for craniofacial symmetrization, as a completely symmetrical face may focus attention on an obliquely positioned head. In some instances, the orbital dystopia is striking and correctable with an orbital relocation osteotomy [Figure 16]. Two pieces of rib are required: one fully cartilaginous piece to reconstruct the fossa and one osseo-cartilaginous piece to reconstruct the missing condyle/ramus [Figure 17]. 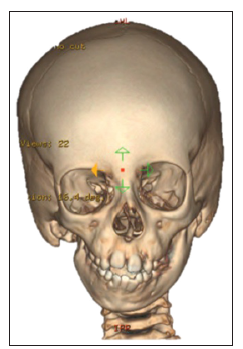 The zygomatic arch is reconstructed or reinforced by a cranial bone graft. The cartilaginous piece is inserted behind the arch onto the skull base and is retained by resorbable sutures placed around the de novo zygomatic arch. 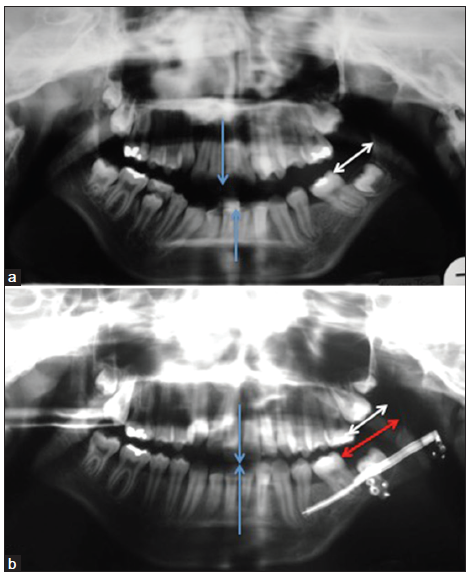 The condylar replacement is fixed onto the ramus, using the temporal approach alone or in combination with an intraoral approach for Pruzansky-Kaban Type III. The cartilaginous part of the condylar replacement may be 1 cm high, as growth is allowed. Swinging the mandible to the healthy side is permitted during joint reconstruction, but it should not cause strain. The main objective is to create a functioning joint, normal range of mouth opening, and abutment allowing for a stable facial rotation procedure at a later age. When obtaining the rib grafts, it is important to remember that rib cartilage may be required for ear reconstruction as well. When only the upper part of the ascending ramus is absent, the craniofacial reconstruction (including calvarial bone harvesting, donor defect reconstruction, zygomatic arch and glenoid fossa reconstruction, and condylar reconstruction) can be performed via a single, wave line incision in the temporal region, extending to the lowest part of the auricular appendage [Figure 18]. Adding a retromandibular incision will jeopardize the facial nerve, as its location is abnormal. Adding an intraoral incision increases the risk of infection of the bone graft. The issue in Pruzansky-Kaban Type IIb and III deformities is the location for the reconstruction of the joint. 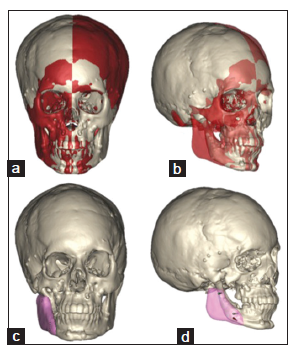 Creating an abutting joint in a location that has been determined by the anomalous development is easier; however, it is doubtful whether medial reconstruction will allow symmetrization of the midface and lateral mandible at a later stage [Figure 19]. Relocation of the joint to a mirrored position is more difficult in terms of the healing of the reconstructed condyle being transplanted obliquely to the mandibular stump. The composition is mechanically unstable when it assumes a 30° angle in the frontal plane. 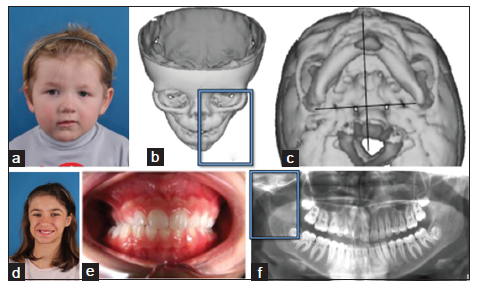 In extreme cases of sagittal deficiency such as that found in Pruzansky-Kaban Type III it is not necessarily desirable to advance the mandible into a position that will allow the soft tissue profile of the chin to be the ideal, as determined by Facewizz software (Orthoface R and D, Sint-Martens- Latem, Belgium) (www.facewizz.com). Such advancement will be opposed by the sphenomandibular ligament and the geniohyoid muscles, thereby jeopardizing the maintenance of occlusal stability. 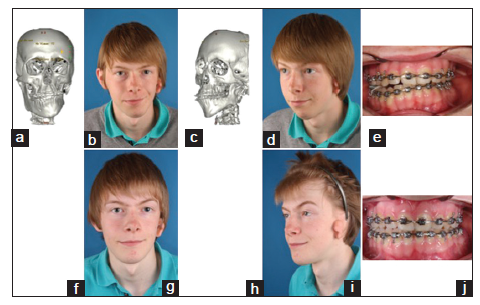 Maxillary, mandibular, and chin advancements should be tailored to the encountered strain. 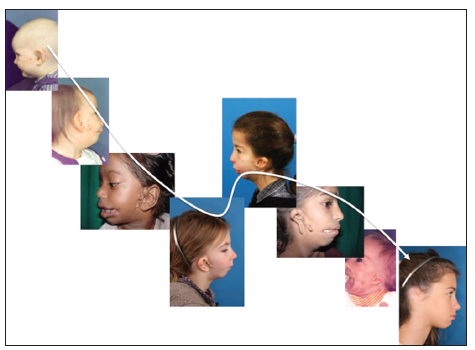 In these instances, chin augmentation with calcium phosphate paste (Hydroset, Stryker, Kalamazoo, MI, USA) can be helpful in increasing chin projection [Figure 20]. Several options exist for augmentation of the lateral aspect of the ramus, but few exist for augmentation of the posterior aspect. For lateral augmentation, sliced lyophilized cartilage grafting can be an option if this is still available. Bone grafting may lead to resorption, and alloplastic implants may lead to extrusion after infection, hydroxyapatite granules mixed with fibrin glue provide a better option. Both lateral and posterior augmentation are possible using 3D printed titanium, designed according to the postoperative computed tomography scans. For this purpose, the authors use ProPlan CMF and 3-matic software of Materialise (Heverlee, Belgium). Layerwise 3D-Systems (Heverlee, Belgium) prints the implants with porous bone interfaces and sandblasted soft tissue interfaces [Figures 21 and 22]. Two important questions during the design process are: (1) is the “normal” jaw angle excessively prominent and in need of reduction, and (2) will the soft tissue (e.g. masseter muscle) deficiency already be compensated for by adding hardware? The vertical ramus compartment in hemifacial microsomia can exhibit variable degrees of hard or soft tissue deficiencies. Growth and development result in distorted proportions in both the transverse and sagittal dimensions. Surgical correction is challenging with respect to decision-making and execution, but is nonetheless highly rewarding. Older strategies have been tackled by newer technologies. The author has witnessed the rise in popularity of 3D early osteodistraction,[11,12] and then its subsequent fall in use. Microvascular fibula transfer in a young patient[Figure 23] has been used, but the author has returned to nonvascularized rib transplantation. Microvascular parascapular dermofat transfer has been abandoned by the author in favor of nonvascularized gluteal fat transfer. 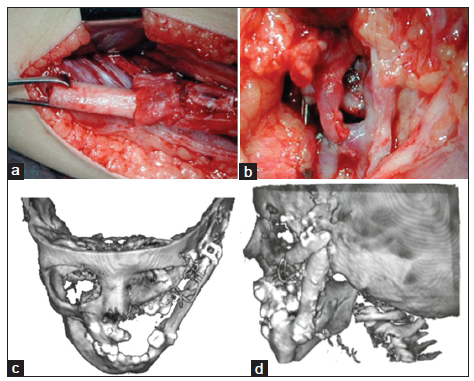 The author has also used 3D printed condyle/fossa reconstruction in adults with ankylosis[Figure 24] with consideration for integration in the facial rotation procedure for hemifacial microsomia following rib graft failure. This article represents level 5 evidence, and therefore simply provides an expert opinion. The variability of pathology, lack of a gold standard, different surgical experiences, duration of the phased treatment, desiderata, compliance and economic situation of the patients, and use of new technologies prohibit valid sampling and prospective analyses. Nonetheless, it is hoped that the comprehensive treatment planning described in this report may be used to promote optimal patient care. 1. Grabb WC. The first and second branchial arch syndrome. Plast Reconstr Surg 1965;36:485-508. 2. Vento AR, LaBrie RA, Mulliken JB. The O.M.E.N.S. classification of hemifacial microsomia. Cleft Palate Craniofac J 1991;28:68-76. 3. Pruzansky S. Not all dwarfed mandibles are alike. Birth Defects 1969;5:120-9. 4. Kaban LB, Moses MH, Mulliken JB. 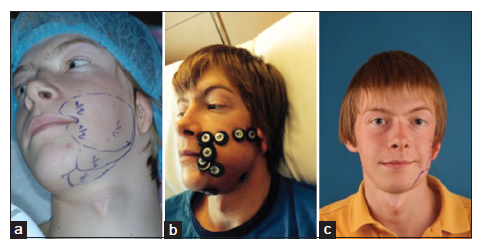 Surgical correction of hemifacial microsomia in the growing child. Plast Reconstr Surg 1988;82:9-19. 5. Harvold EP, Vargervik K, Chirici G. Treatment of Hemifacial Microsomia. New York: Alan R. Liss; 1983. 6. Kaban LB, Moses MH, Mulliken JB. 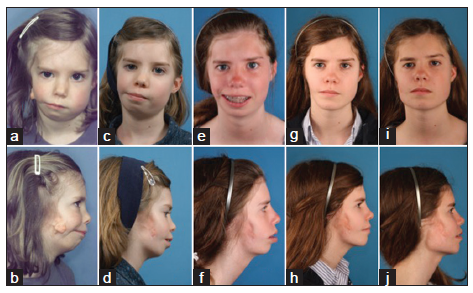 Correction of hemifacial microsomia in the growing child: a follow-up study. Cleft Palate J 1986;23 Suppl 1:50-2. 7. Mommaerts MY, Nagy K. Is early osteodistraction a solution for the ascending ramus compartment in hemifacial microsomia? A literature study. J Craniomaxillofac Surg 2002;30:201-7. 8. Nagy K, Kuijpers-Jagtman AM, Mommaerts MY. 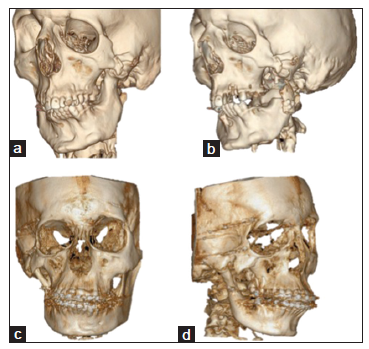 No evidence for long-term effectiveness of early osteodistraction in hemifacial microsomia. Plast Reconstr Surg 2009;124:2061-71. 9. Obwegeser HL. 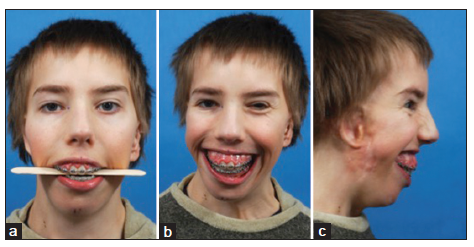 Correction of the skeletal anomalies of oto-mandibular dysostosis. J Maxillofac Surg 1974;2:73-92. 10. Peltomäki T. Growth of the costochondral junction and its potential applicability for the reconstruction of the mandibular condyle. Turku: Turunyliopisto; 1993. 11. Molina F, Ortiz Monasterio F. Mandibular elongation and remodeling by distraction: a farewell to major osteotomies. Plast Reconstr Surg 1995;96:825-40. 12. Ortiz Monasterio F, Molina F, Andrade L, Rodriguez C, Sainz Arregui J. Simultaneous mandibular and maxillary distraction in hemifacial microsomia in adults: avoiding occlusal disasters. Plast Reconstr Surg 1997;100:852-61. 13. Kunz C, Brauchli L, Moehle T, Rahn B, Hammer B. 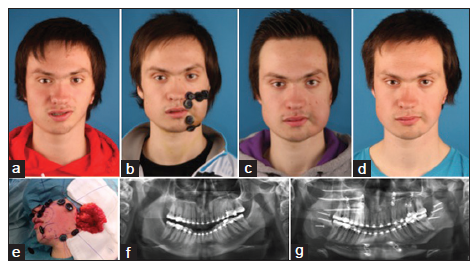 Theoretical considerations for the surgical correction of mandibular deformity in hemifacial microsomia patients using multifocal distraction osteogenesis. J Oral Maxillofac Surg 2003;61:364-8. 14. 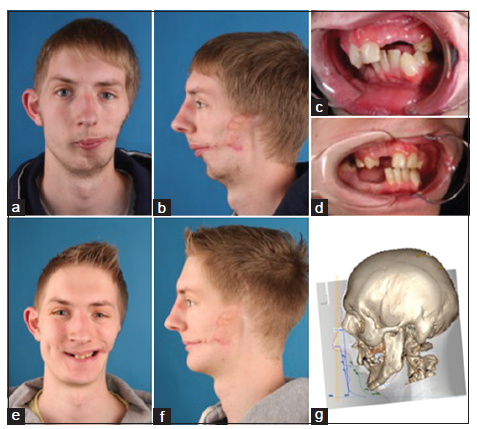 Stelnicki EJ, Boyd JB, Nott RL, Barnavon Y, Uecker C, Henson T. Early treatment of severe mandibular hypoplasia with distraction mesenchymogenesis and bilateral free fibula flaps. J Craniofac Surg 2001;12:337-48. 15. Lee SJ, Lee HP, Tse KM, Cheong EC, Lim SP. Computer-aided design and rapid prototyping-assisted contouring of costal cartilage graft for facial reconstructive surgery. Craniomaxillofac Trauma Reconstr 2012;5:75-82. 16. Tanna N, Broer PN, Roostaeian J, Bradley JP, Levine JP, Saadeh PB. 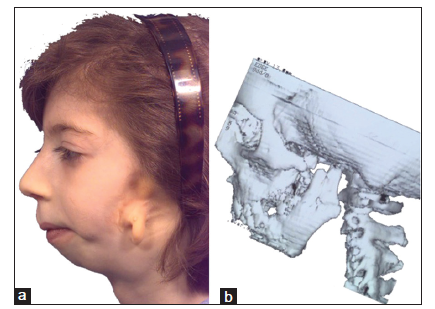 Soft tissue correction of craniofacial microsomia and progressive hemifacial atrophy. J Craniofac Surg 2012;23:2024-7. 17. Lim AA, Fan K, Allam KA, Wan D, Tabit C, Liao E, Kawamoto HK, Bradley JP. 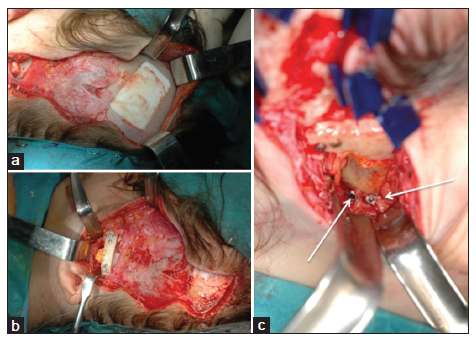 Autologous fat transplantation in the craniofacial patient: the UCLA experience. J Craniofac Surg 2012;23:1061-6. 18. Haq J, Patel N, Weimer K, Matthews NS. 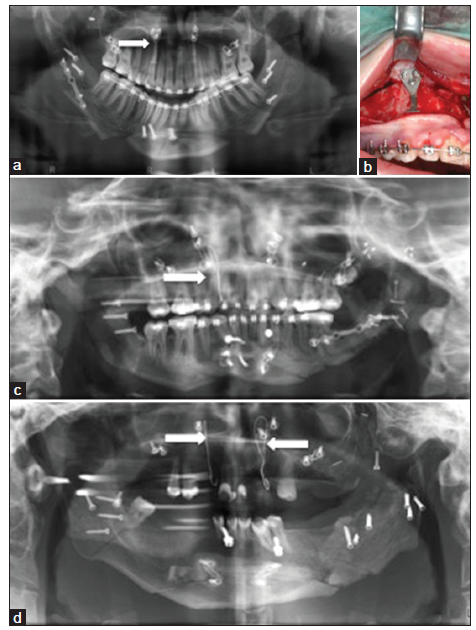 Single stage treatment of ankylosis of the temporomandibular joint using patient-specific total joint replacement and virtual surgical planning. Br J Oral Maxillofac Surg 2014;52:350-5.